Am I A Bad Person For Wanting A Traditional Funeral? When I started Elemental, my goal was to create an environmentally friendly alternative to the traditional funeral model. Living in Seattle, I saw a need for more options that fit into the lifestyle choices that were popular here, as well as addressed the growing cost of traditional funerals. Personally, traditional funerals have never spoken to me, and my time working in the more conventional side of the industry really put me off of the idea of wanting a “traditional funeral”, mainly because I saw how predatory many of the sales tactics were. My experience was that many traditionally focused groups were definitely more interested in the bottom line than they were about client care. I opted to go my own direction and try to create a paradigm shift in the local market. Clients keep showing up, so I guess it’s working! The beautiful thing about the death positive movement is that it’s all about choice, both pre- and post-death. If you don’t have conversations about death prior to its arrival, bad situations can happen, the least of which could be ending up with a funeral service in a style you never wanted. We would much rather you open your mouth and say, “I want a traditional funeral with an intricately decorated casket, the best burial vault you can find, and embalming that will allow me to last longer than the pharohs!” than to remain silent about the whole thing. Will you be judged for your choice? Maybe…but do you really care? The heart wants what it wants, so do whatever will make you happy. Funeral directors are required to provide them up front. If you run into a group that will not provide complete pricing information (including casket costs, cemetery costs, storage/embalming costs – basically everything you want for the funeral), run like the wind. The current average cost for a traditional funeral in the U.S. is somewhere in the range of $7,000-$10,000. In 99% of cases, you don’t have to be embalmed for a traditional funeral service (for the purpose of this article, I mean an open casket ceremony held in a funeral home or church, followed by burial at a local cemetery). If embalming is something you are really into, there are options for less toxic, environmentally friendlier fluids to be used in the process. Don’t be afraid to discuss with your funeral director, to see what options are available. You can still have a traditional funeral and burial while making a few environmentally friendly choices. For example, there are a number of casket options available made from renewable materials, like seagrass, bamboo, willow, or more renewable wood option such as pine. 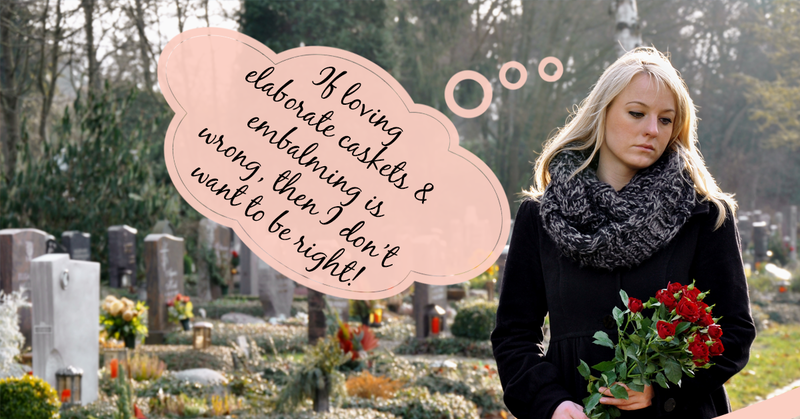 If you opt for no embalming and an environmentally friendly casket, then you may also be able to use a green cemetery, which won’t require a vault…in which case, you’re basically having a natural burial! Not that we would push you to make a choice you’re not happy with – we’re just providing options. By far, the most important thing you can do when it comes to funeral planning, traditional or otherwise, is to let your family know what you want. Even if you are currently healthy, having a discussion about death and what you do and do not want come the end of your life is more imperative than any individual funeral choice might be. Take it from a professional – planning ahead of time makes things a little easier for those left behind after a death, and anything that makes life easier during grief is well worth the discomfort of a conversation.